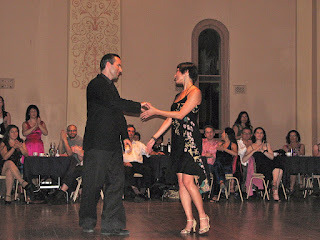 When I went to my first tango class in 2000 milongas in Sydney were a rare occurence. Our teacher, who was exceptional, and who taught many of today's teachers, ran an occasional milonga on a weeknight. But it was about a year into dancing that we discovered there was a milonga on Friday nights at Glebe Town Hall. We gathered our courage and went... but the first few times we simply watched. We were too nervous to get on the floor, and in those days, celebrities like Clive James would occasionally appear, dance and disappear into the night.